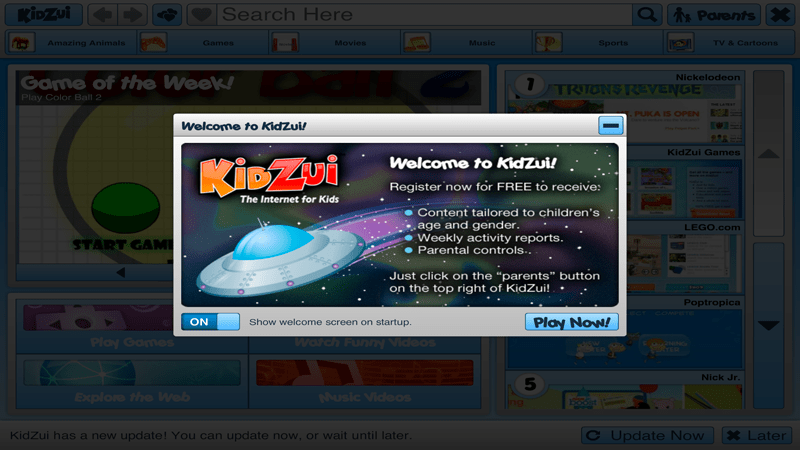 I recently tried out KidZui – the internet browser for kids. Actually, the initial screen is a welcome dialog overlaying the home page. The browser runs full screen with no menu bar visible on my mac. I have two monitors and the secondary monitor is blacked out when KidZui runs. 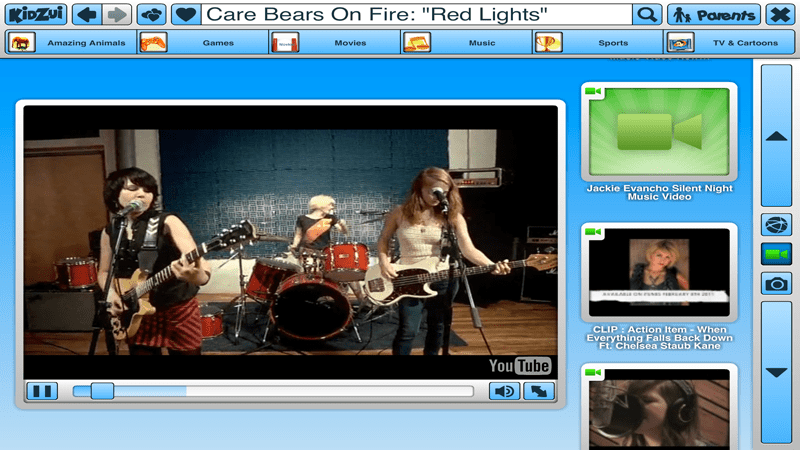 The “Play Now” button is a tip off that this browser is exclusively for entertainment. No dictionary links, no Math practice, no encyclopedic reference sites allowed. Only fun. The Parent button takes you to the parent options, which are limited to receiving usage reports, targeting the material, starting KidZui at startup and requiring a password to exit KidZui. 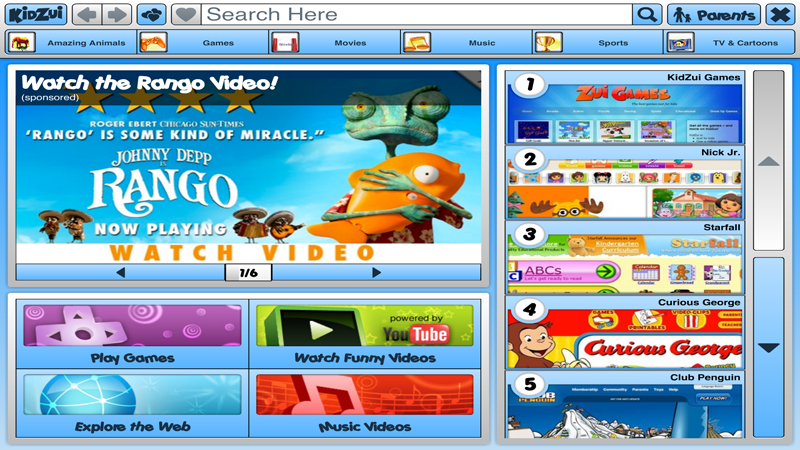 OK, this is an entertainment browser designed to keep kids away from the real computer and all it’s awesome power. You can have KidZui launch at startup, cover the desktop and demand a password to exit. This is the kind of browser you might want if you, say, ran a daycare or after school program and wanted the kids to have access to a browser with controlled content. Or maybe you wanted the family machine to be kid safe at start-up. OK, I can appreciate that. The experience is not unlike what you would find if you went to PBS Kids, or 4KidsTV but with a moderated YouTube mixed in. Thanks for reviewing KidZui, Eric! I’m sorry that you didn’t find the browser more appealing. I would like to point out that there is a lot of educational content available within KidZui, although it may not always appear on the browser’s homepage. The address bar at the top of the browser doubles as a search box which kids can use to look for anything they’d like – art, history, and even math, just to name a few categories. Additionally, KidZui features a “homework helper” section, which offers a number of websites and videos that are categorized based on the US National Curriculum. If your child is in third grade, he or she can search the 3rd grade homework helper category for websites that are relevant to what he or she is currently learning in school. We most definitely sympathize with your desire to see more educational content in KidZui, and hopefully you’ll find this information useful. Thanks again for the review!